After 15 seasons and 336 episodes, the Las Vegas Crime Lab is closing its doors. I actually didn’t watch Season 15 because… actually can’t think of why I didn’t watch the final season of CSI: Crime Scene Investigation! It just sort of dropped of my radar. Truth be told, I was kind of getting sick of the show. It just wasn’t the same without the somewhat apathetic Gil Grissom heading the team. However, when they announced they were finally ending the series after 15 years, I just had to watch the final 2-hour special episode. Besides, Grissom’s back! It’s only fitting he’d be returning to close things out! CSI: Crime Scene Investigation’s “2-part television event,” fittingly entitled “Immortality,” starts off with a bang, literally. A suicide bomber detonates an explosive in the Mirage, the casino owned by former CSI member Catherine Willows. Sara Sidle is put on the high profile case as a way to prove herself as a suitable candidate to become the new head of the Las Vegas Crime Lab since DB Russell has been transferred to the Cyber division in Virginia. Catherine uses her FBI clearance to fly back to Los Angeles and help with the investigation. When evidence points to Lady Heather, an old flame of Gil Grissom, the former head of the Las Vegas Crime Lab is called in to consult, which miffs Sara, his former wife. The episode primarily focuses on the trio of Grissom, Catherine and Sara. 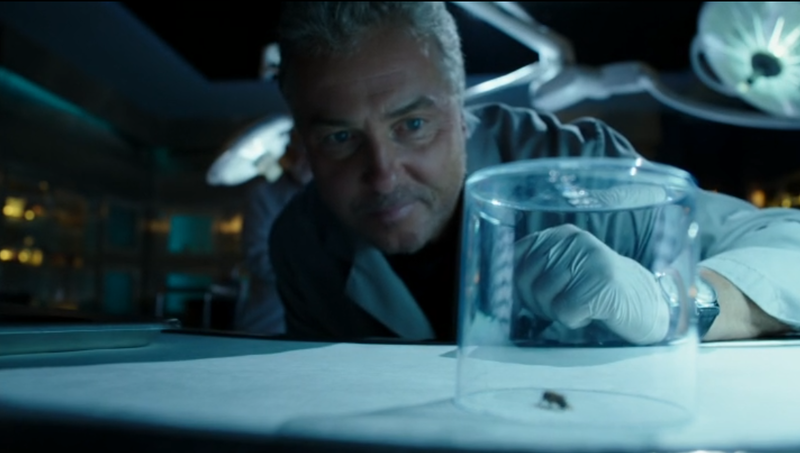 Honestly, it was great to see William Petersen back as Gil Grissom. He was my favorite character and one of the biggest reasons why I liked CSI so much. Oh, seeing Catherine back was also a treat as she was a big part of the show as well. However, it seems odd they didn’t really try to interact with some of the old cast members who stuck around all those years. Capt. Jim Brass is there but only for a few scenes. Doc Robbins hardly interacted with his “good friend” Grissom; the two were usually really chatty in older episodes. Greg Sanders is in the episode but doesn’t really do anything. The usual witty banter between Grissom and David Hodges was kept to a minimum. Heck, Nick Stokes didn’t even make an appearance! Okay, I did read that the character left to head the San Diego Crime Lab. But, come on! It’s the series finale! Even Julie Finlay was in it, albeit in picture form! In fact, the only person the three have any real contact with is DB Russell. Storyline-wise it does make sense as he’s the current head of the Crime Lab. However, the chemistry he has with Grissom and Catherine was actually really good. That’s more of a testament to Ted Danson’s acting rather than the character. I heard the character is moving to CSI: Cyber, the only CSI show I don’t care about. But maybe with Ted Danson swinging over, I may reconsider watching the show. Back to Immortality. The case itself was, frankly speaking, really weird. The show’s mantra of “follow the evidence” is still in full effect, with the team managing to piece together clues to get new leads. Some of them are really… odd. However, in retrospect, it’s par for the course for CSI. Despite supposedly based on science, the show has taken a lot of logic leaps to get to the conclusion and Immortality is no exception. I guess it just felt magnified since it’s 2-hours this time. Of course insects are involved. It’s Grissom after all! Although it’s supposed to be a “series finale,” Immortality has a lot of loose threads it didn’t tied down. Only two characters (not mentioning who as this is a spoiler free review) are given a satisfying, and rather cheesy, conclusion. The futures of a majority of the characters, however, are left hanging in the air. With DB moving to the Cybercrime division, here’s hoping some of the cast make the move there in the future. Simply put, with so many open ended questions, Immortality doesn’t really give a satisfying conclusion to CSI: Crime Scene Investigation. As I’m a fan of the earlier seasons of the show, I enjoyed Immortality for the most part. I’m not sure if the viewers who weren’t weaned on Grissom and Catherine, basically the fans of the later seasons of CSI, will probably not enjoy it as much as I did. However, most longtime fans of the series will enjoy the nostalgic feeling of watching Grissom and Catherine back in Las Vegas doing their thing. It’s a decent sendoff for longtime fans. Much like the title of the episode, CSI has indeed gained “immortality” as it will never be forgotten. Have you seen the 2-hour series finale of CSI: Crime Scene Investigation? What did you think of it? Let me know your thoughts and opinions of the show in the comments below! Like you stated above so eloquently, it was great to see Grissom once again. But to me the finale felt like crowded and rushed. I wasn’t keen on either the storyline or the case. Personally I think by making it revolving a plotwagon character, Lady Heather, it turned Immortality into a lousy triangle story. CSI was nothing of the sorts. Grissom might wobble here and there over the seasons. But it was always Sara, the one he loved but couldn’t allow himself to love or be loved due to his various personal reasons. He evolved from a man of imperial science to man of heart in S9 when he gave up his old life to be with Sara. So, why Zuiker gave us this old Grissom from the early seasons again? He came off as older but no wiser; still blinded by his loyalty to his friend, Lady Heather. CSI mucked up his character integrity completely in S13. The old CSI took 9 seasons to build up this unconventional GSR story arc, the Forget Me Not scriptwriter dismantled it in mere minutes for no reason other than he had no idea how to make a long distance marriage viable without having Grissom/Petersen on screen. I’d think Zuiker would use the finale to explain why Grissom would divorce his Sara over the phone. But, no. Grissom spent valuable screen times to rehab Lady Heather’s image! WTH they were thinking? Besides, Lady Heather already took way too much screen times away from Henry, Greg, Morgan and Hodges! We hardly saw Doc and Super Dave. I don’t know why Immortality — the CSI series finale — was a LH centric episode. What this woman from the shady side of town ever did to claim such honor? She shortchanged all the regulars and made the finale a joke. It was regrettable and disappointing. A long-time fan like me deserves better. That being said, I am grateful we had CSI at all. I will miss the show terribly.